After the Armistice, Jim Waddell stayed in the Army for another 11 months until the beginning of September, 1919. He became Chief Clerk for Captain R.N. Thompson and their base of operations settled in Namur, Belgium as HQ4 (Fourth Army Headquarters) area Namur. What was the nature of the work that they were doing in Namur after the armistice? General H.S. Rawlinson, named on the Boar's Head Club's Rule book as the President, had reassumed command of the Fourth Army from July 1918. According to The New Zealand Division 1916 - 1919: A Popular History Based on Official Records on the outskirts of Namur, on December 11th, 1918, General Rawlinson watched the New Zealand Rifles march past as part of the advance of the Second and Fourth Armies into Germany. By the end of July 1919, General H.S. Rawlinson had been appointed to go to Russia to lead an evacuation of Allied forces. Jim Waddell clearly had a good relationship with Capt. Robert Thompson as indicated by this glowing recommendation. Surely the reference letter helped Jim secure work after he left the military. No. P14763 L. cpl. Waddell M.F.P. has served under my command for over two years, and during that period he has done very excellent work nearly always under very heavy shellfire and enemy bombing. His courage and devotion to duty have set a very fine example to all arms of the service. I have recommended him for the Meritorious Service Medal. He is tactful and handles those under him in a good manner, his discipline is excellent. I cannot speak too highly of this N.C.O's work, since the armistice he has been my Chief Clerk and as such has had to deal with the most confidential papers, he has never on any occasion betrayed the trust I placed in him. I much regret the loss of his services to the Army and hope this small tribute for all he has done for me will be useful to him. I will always be glad to hear of his welfare and help him in any way. Robert N. Thompson Captain. WAPM HQ 4 area. Namur 6/9/19. After the Armistice, during the year 1919, the opportunity to relax and enjoy being in Namur, Belgium, must have been a great relief to a war weary soldier, such as Jim Waddell. 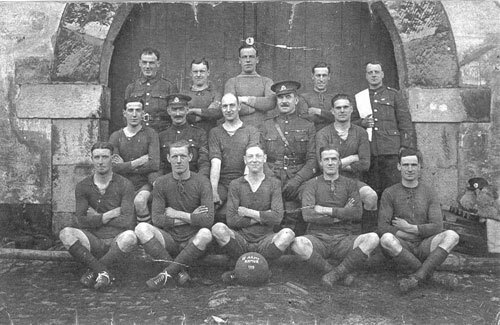 Jim Waddell played soccer as a member of the Army Soccer team as is evident from the photo below. Jim is seated second from right, front row. Who would they have competed against? A social club with General Rawlinson as the President offered entertainment and social activity. 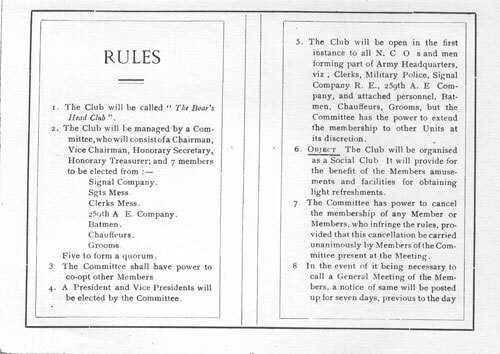 Jim's involvement as a member of this club may have inspired his involvement in and leadership of social clubs once he was working at Bell Telephone Company in Montreal. 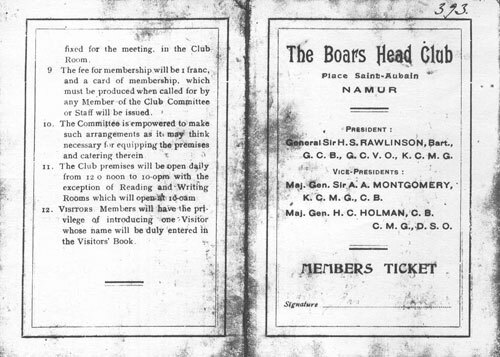 Might Jim have been elected as one of the members of the Managing Committee of the Boar's Head Club? While in Namur, Jim Waddell was billeted with a local family. Years later, his daughter visited that family who remembered him.